Thankfully everyone in the galaxy can now wake up on time; and not to some new-fangled digital beeping or old school metal clanging either. 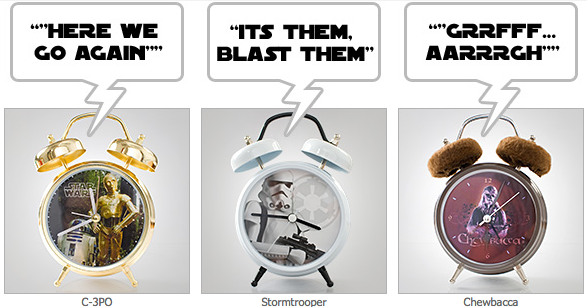 With the Star Wars Talking Alarm Clocks you can wake up to your favourite catch phrases from three of the most iconic movie characters ever. At the moment, only the C-3PO clock is available although Chewbacca and Stormtrooper are coming soon. The cost is £19.99 and they are available over here.